Register and get all the event details here. Join thousands of runners and walkers for the annual Turkey Trot Los Angeles on Thanksgiving morning. Who: Everyone is welcome! Register HERE. 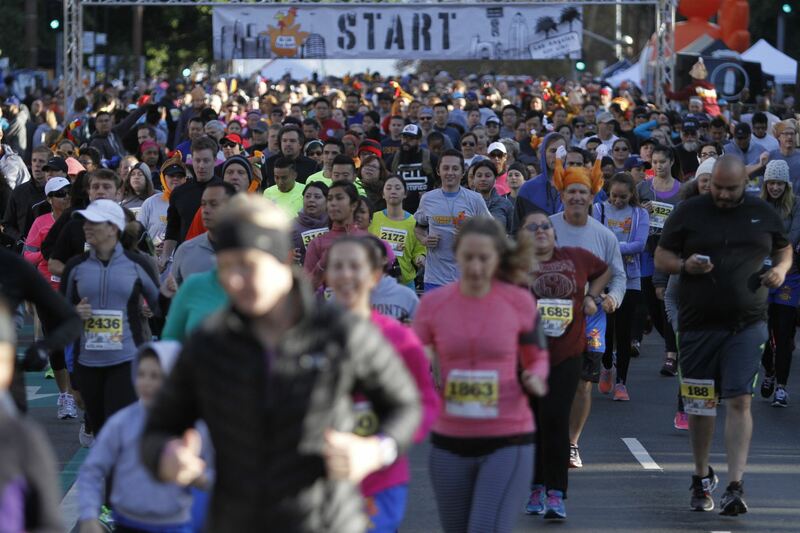 What: The sixth annual Turkey Trot Los Angeles presented by UAE-USA United. Participate in the 5k, 10k, or 1 mile Widdle Wobble for kids. Everyone gets a rockin’ trucker hat, sparkly finisher medal, and bib. When: Thanksgiving morning – November 22, 2018 from 8:00 a.m. to noon. Packet pickup opens at 6:45 a.m. on race day. Get the full schedule HERE. Where: Downtown Los Angeles. The race starts and finishes in front of City Hall at 200 N Spring St, Los Angeles, CA 90012. Why: In the spirit of Thanksgiving, this event benefits the Midnight Mission – an amazing organization that offers a path to self sufficiency to those experiencing homelessness. Register today and help make a difference! Turkey Trot L.A. is also proud to partner with BOMBAS this year. Make a difference in the lives of Los Angeles’s neediest individuals by registering and buying a pair of Bombas socks. For each pair sold, another pair is donated to The Midnight Mission along with a donation of $12.00! Want to Win Airline Tickets? Check out The Midnight Mission Raffle! For each $25 donation to The Midnight Mission, you’ll be entered in to the raffle. You can donate during online registration, on race day at The Midnight Mission booth (cash or card accepted) or online HERE. Raffle proceeds benefit The Midnight Mission. The winner will be announced on Monday 11/26. This year all 5k and 10k participants will receive a Turkey Trot LA trucker hat! Widdle Wobble participants receive a t-shirt. Unique Finishers Medals for ALL participants! Goodies from the rockin’ expo! Check out the 2018 SWAG! ARRIVE EARLY! With so many people checking in on race morning, please arrive early so you have plenty of time to park, pick up your bib/trucker hat, and get to the start line. Race day packet pick up opens at 6:45 AM. Packet Pick Up is located on 1st Street between Spring St. and Main St.
We expect a lot of people in the morning and we are requesting that 10k participants wait until 8:00 a.m. after the 5k starts, to pick up your bib. This will allow the 5k participants to get their bib on time. Your cooperation is greatly appreciated! Many parking lots in Downtown LA will be closed on Thanksgiving Day. We strongly recommend all Turkey Trot participants to reserve a parking space in advance at this lot right along the route. We are also encouraging everyone to take the METRO. There is a stop at Grand Park. For only $3.50 (+$1 for a TAP Card) you can ride down to the race and back using the Metro Red or Purple Lines (and don’t have to worry about parking)! Road Runner Sports (Free 90 min parking in the garbage next to RSS)! Capital One Cafe DTLA (free 45 minute parking validation)! Merchandise can be purchased during online registration or on race day. Merchandise will be available for pick up on race day or at packet pick up. For each pair of socks purchased, we will donate a pair of socks as well as $12.00 to the MIDNIGHT MISSION – an amazing organization and homeless shelter that offers a path to self sufficiency for those that have lost everything. Each BOMBAS sock is constructed using the company’s proprietary Sock Tech, comprised of several substantial improvements to the comfort, performance and design of the traditional sock. These socks are truly amazing! !